In the last blog post, I considered how a route-oriented measurement of Spontaneous Accessibility could be more illuminating to planners than ridership-based measurements of route productivity. The post analyzed some routes that King County Metro labeled as the most unproductive in their system, and found a variety of clues about their lack of productivity by measuring Network Accessibility Contribution. This post views those previous results in a broader context. 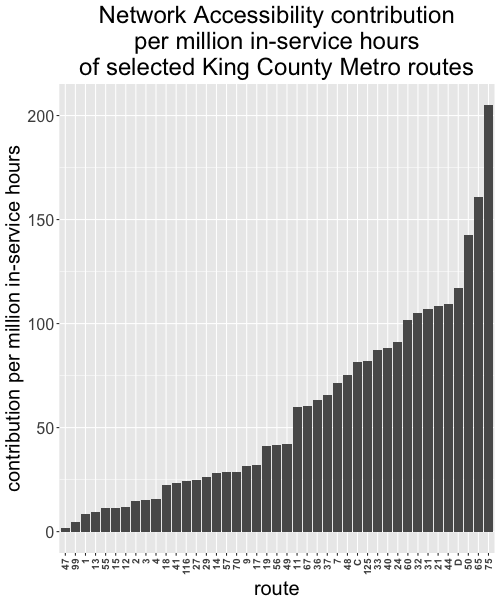 In this analysis, I selected every King County Metro route that met two criteria: the route must run entirely in Seattle, and it must not have changed substantially in routing since the ridership data published in the 2016 Service Evaluation was collected. I selected August 31, 2017 as a typical weekday and, for each route, calculated a 2000-sample Sampled Network Accessibility Contribution where the change was to delete the route. For each of these contributions, I negated the measurement, so that it is the accessibility gain of the route existing rather than the (negative) benefit of its non-existence, and divided it by the total amount of vehicle hours that service on the route requires. The lack of this additional step was mentioned as a weakness of the analysis in the previous post. 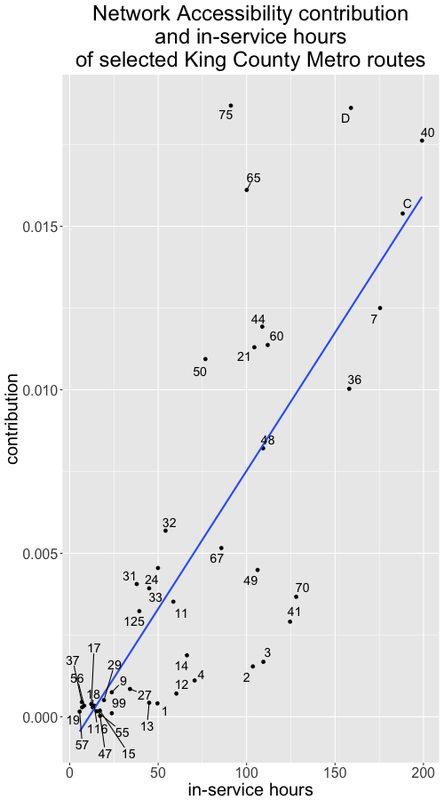 Measuring the contribution on a rate basis rather than an absolute one allows the contributions of routes of very different lengths, spans, and frequencies to be compared fairly. The results are shown in the two charts below. There are several noteworthy conclusions. The previous post established low absolute SNAC measurements for routes 47 and 99. On a rate basis, these routes similarly provide extremely low value. This additional information confirms that these routes have a low SNAC for reasons other than their short length. Poorly performing routes 24 and 33 are above average in terms of their rate-basis SNAC. This is a challenging situation to rectify: the routes allow trips that other routes are unable to provide. Nevertheless, riders are not using these routes at the expected rate. A consideration for routes of this nature may be to improve frequency despite their present unpopularity. The lack of use may stem from potential riders choosing other means of transportation because timing the bus trip is an inconvenient stricture. Looking at routes with exceptional rate-basis contributions, there are not clear commonalities. Route 75 (comparative map) provides the highest absolute contribution by a scant margin, but relative to its in-service hours it is significantly the leader. It connects two major transfer points, the University of Washington campus and the Northgate Transit Center, in an indirect, backwards-C shape. The east-west portions of its route have several connections to north-south routes, while the north-south portion serves a corridor that is not readily accessed by other transit. Route 65 (comparative map) is a fairly direct north-south route in northeast Seattle. Route 50 (comparative map) meanders through a largely east-west path in south Seattle with multiple connections to frequent light rail service. These three routes are similar in that they do not directly serve downtown Seattle and do not cross bridges over the Lake Washington Ship Canal, which are frequent chokepoints. However, the route with the next-highest rate-basis contribution is the Rapid Ride D line (comparative map), which shares none of the previous properties. While the lack of commonalities between routes that contribute the most to Spontaneous Accessibility may be disappointing, it is an important result. There is no simple set of properties that make a transit line valuable. Instead, it is vital to analyze each route in terms of its contribution to the entire network. Spontaneous Accessibility contribution measurements are ideal for guiding this process, allowing both immediate and careful analysis of transit routes.